Gotta Question about Thanksgiving? I'm here. 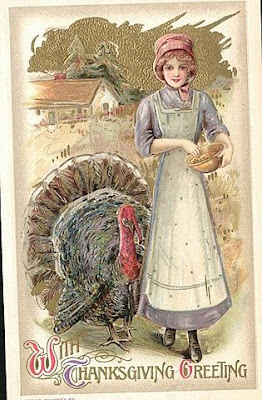 I'm not wearing a bonnet and I'm not scattering corn for tom turkey, but your old Pru is right here. I'll be answering questions all day as they come in. I promise to check back every hour or so, so lay down your worries, your fears, your trepidations on old Prudy. I'll add new responses to the top of the list all day long. Bewildered in Buckatunna said “Okay, Prudy, here's a question: I made some homemade pie crusts a few weeks ago (BEFORE you posted your tutorial)froze them, rolled them out a little while ago and now I want to bake them without filling them first. How long and at what temperature? I'm getting varying degrees from my internet search and the pie crust recipe does not have instructions to bake without filling. I looked in your tutorial, but I might have missed it. It's an all shortening crust. For prebaking piecrusts the big variable is shrinkage. Prebaking crusts causes them to shrink, but if that isn’t an issue, then you can safely bake them at 350 for 10 minutes. (I recommend an egg yolk wash for custard pies-see wiley family question below.) If you are worried about shrinkage, you will need to fill the pie with weights, which will increase the baking time. PLEASE do not go and buy pie weights! I fit a piece of foil into the pie pan on top of the crust and fill it with dried beans or rice. (Save the beans or rice to use as permanent pie weights, since they are no longer fit to eat.) With the pie weights in the crust, you’ll want to increase your baking time to 16 minutes at 350. That should do the trick nicely! #6 Heather asked "Any suggestions for make ahead mashed potatoes. I have a 3 hour gap between when I need to be done with the prep and when we eat. I'm hoping to not have to resort to dried potatoes." The problem with early prep on the mashed potatoes is that they tend to collapse and lose their fluffiness. You can make them two hours early and put them in a crock pot, but after that their structure begins to break down. But you know what? They’re still absolutely delicious when flatter. When I have to make them ahead of time (up to 24 hours ahead), I try to capitalize on the denser texture and make them ultra-rich. I boil about 5 pounds of potatoes in salted water, then mash them with about 6 tablespoons butter, 1 cup half and half and a 8 ounces of cream cheese. Season to taste with salt and lots of freshly ground pepper. Pile them into a buttered 9 by 13 and dot the top with butter. Reheat them in the oven for about 25 minutes on 350. They’re incredibly fantastic! Can I make pumpkin pie today or will it go soggy by tomorrow?? I use to make it like my grandmother by cooking the filling like a custard and put in baked shell when you serve it, but my husband wants a traditional pie. The best way to prevent your pumpkin pie crust from going soggy from an early bake is to prebake your crust with an egg-yolk wash. Brush the insides of the raw dough in the pie pan with a beaten egg yolk. Bake for 10 minutes on 350. It’ll help create a barrier between the custard and the crust. That being said, custard pies tend to have denser, less flaky crust underneath the filling. And that’s OK. Bake your pies today, refrigerate them tonight ONLY if you like them chilled, either way-they’ll be delicious tomorrow. This year, my husband is deep frying the turkey. So, my question is about gravy. Since we will have no pan drippings , can I still make gravy? In years past, we've used store bought gravy when we deep fried the turkey, but I don't like the store bought stuff. Any suggestions? I can’t blame you for not liking the store bought stuff. It’s an impostor that only LOOKS like gravy. Gravy is a Thanksgiving staple, so you’ve got to get some on that table, even if you smoke, fry or grill your turkey. First of all, start of by making the gravy base HERE which is basically a cider and broth reduction thickened with cream and a flour/butter roux. Next, you’re going to create some flavorful drippings by dusting lightly in flour and browning in butter some inexpensive, bony poultry pieces. Chicken wings and drumsticks work great, and you can even toss in the turkey neck that they store in the turkey cavity (thank goodness for euphemisms!). When you’ve browned your meat, remove it from the pan, and freeze it for another day when you’re ready for it. Deglaze the cooking pan with about 1 cup chicken broth, scraping up all of the lovely browned bits. Add them to your gravy base and you’ll be a happy camper and a happy turkey smoker, too. #3 Mom 24 wrote: In light of the economy, I went for one of those super-cheap supermarket birds. Now I'm suffering buyers remorse. It's been injected with a saline solution so I can't brine the bird. Do you think it will still be good? It's a 20 pound bird, so it's going to need to cook for quite a while. Any advice? Mom 24, this is an excellent question. The cheapest turkeys come pre-brined and that scares many of us away from hunting the best deal. But never fear. You can brine anyway! It helps to remove the commercial brine flavor and injects the turkey with lots of juicy good flavor. The only difference is that I do use half the salt in my brining solution. Brine your 20 lb. turkey in 10 gallons of water with ½ cup table salt (or 1 cup kosher salt). You can add a bit of sugar, thyme, allspice, and lots of black pepper. I promise you’ll have a juicy fat bird with a fatter pocket book to boot. thanksgiving questions? i'm wondering about a new sweet potato recipe. something that doesn't compete with dessert in sweetness. any ideas? Michal, some people love a little sweet on their plate to balance out the savory flavors of turkey, stuffing and gravy. Then there are others that prefer their sugar to be called dessert and to be served after the meal. I can appreciate both camps, but on Thanksgiving, I like my sweet potatoes to be on the less sweet side also. Here’s my favorite recipe for a sweet potato dish, balanced with tart apples a spike of orange juice and a not-too-sweet brown sugar streusel. Bake 2 large yams until tender in the microwave, about ten minutes. Peel and slice into rounds. Pierce 2 whole green apples with fork and microwave for two minutes on high, just to soften a little. Slice into unpeeled rounds. Layer slices of peeled sweet potato and unpeeled green apples in a butter 8 inch baking dish. Between each layer, dot with a little butter and sprinkle with chopped pecans and tablespoon of brown sugar for each layer. When you’ve finished, in a separate bowl combine 1/3 cup brown sugar, ½ cup orange juice, and 1/2 teaspoon cinnamon. Pour over the top and bake for 40 minutes at 325. #1. " It is just my hubby, me, our toddler and infant so we aren't making a large turkey. I purchased a frozen whole turkey breast and was thinking of cooking it in the crockpot. Do you have any general suggestions or specific seasoning suggestions? I haven't found a recipe yet." That sounds like a cozy Thanksgiving for four! It's a great idea to use a turkey breast for smaller crowds. Its actually kind of nice to not deal with bones, carving, carcasses, etc. I've got a great, easy recipe for you: Place 4 tablespoons butter in the bottom of your crockpot. Cover with your turkey breast (seasoned all over with 1 teaspoon each salt and pepper and 1/2 teaspoon dried sage). Pour over 1/2 cup chicken broth and 1 cup cranberry sauce. Let cook on low for 8-10 hours, or on high for 4-5. It'll be tender and delicious with a fantastic sauce. Enjoy with your sweet little family! Next question: Bring it on! In light of the economy, I went for one of those super-cheap supermarket birds. Now I'm suffering buyers remorse. It's been injected with a saline solution so I can't brine the bird. Do you think it will still be good? It's a 20 pound bird, so it's going to need to cook for quite a while. Any advice? I'll answer your question a little later, but don't worry-it's going to come out great. You still can brine it and I think it's a good idea to wash away the flavor of the commercial saline solution. (I would use a brine recipe, but only put in 1/2 the salt it calls for.) I'm doing the same thing with my econo-turkeys that are pre brined also. I wanted to give you a super fast answer in case you wanted to brine this morning. For a 20 lb. bird, I'd use about 1/2 cup table salt, 10 gallons water, some allspice, pepper, bayleaves and a pinch of sugar. Good luck! I put my frozen turkey in my little fridge last friday to thaw. It was still frozen solid last night. Took it out late and left it on the counter. Hubby put it back in the fridge early this morning. Plan on putting it in the brine tonight. I didn't have time to do it this morning. That should be enough time in the brine before putting it in the oven on Thursday? Have a happy Thanksgiving Prudy!!! Great idea today. Thanks for helping us. I've been in this situation before, too. You can speed the thawing process by filling your sink with cold water and putting your turkey in there for a couple of hours. I've started the brine with a frozen turkey before and it came out just fine! 24 hours should be plenty of time to still get the benefits of a brine. I've done two in separate brown bags, same time and same temp. They come out beautifully! I left you a message on my last post about doubling in a 9 by 13. Thanks for coming, sweet new friend. THANK YOU so MUCH..YOU ARE SUCH A DOLL! Can you use the apple pie in a brown bag pie crust for baking pumpkin pie??? That crust is out of this world!! You bet! I'm so glad you liked it. Just be sure to prebake it for 10 minutes before filling with the pumpkin pie filling. Happy T day. I'm so glad you are doing this, because I have a very important Thanksgiving Dinner question for you. . . What time shall I be at your place? Anyhoo, not sure if you got my e-mail update or now? I sure missed your posts... I have yet to give brining a chance.. I don't have enough confidence. If you ever decide to quit blogging, please don't take your blog down. (This happened with another blog.) I haven't been writing down all the wonderful recipes and would be at a loss if that happened. Love, love , love you! Never fear! I'm completely addicted to blogging-and it's because of readers like you. Thanks so much for your kind words. What a great way to start the day! Any suggestions for make ahead mashed potatoes. I have a 3 hour gap between when I need to be done with the prep and when we eat. I'm hoping to not have to resort to dried potatoes. Can I make pumpkin pie today or will it go soggy by tomarrow?? I use to make it like my granmother by cooking the filling like a custard and put in baked shell when you serve it, but my husband wants a traditional pie. You are my new best friend for your recipe for cooking a turkey breast in a crock pot on this post. Duh on me! I have never thought of that! Always hate cooking a whole bird for just a few but the turkey breast comes out dry (in my opinion) when cooked in the oven. Can't wait to try your idea. prudy, thanks for answering my sweet potato question. it looks perfect! Thanks a bunch! I really like the idea of the egg yolk sealing the crust. I knew it helped it brown better, but I didn't think about it sealing it. A little trick I do for chocolate and some cream pies is to paint the bottom and sides with a thin layer of melted chocolate and that will harden and seal them, too. crockpot turkey breast! brilliant! i will be trying this even though our thanksgiving is already a month past. I told you-I am awful in the kitchen, BUT I am having so much fun trying! Mark and I had a great laugh before heading to bed, and I will always remember my first (technically second b/c I had finished the VERY first about an hour before) attempt at baking a pie. **I must also note, I took my two non-fire-roasted pies to Kaden's Thanksgiving Feast, and ALL the parent's raved about how good they were! I had at least three parents hunt me down, ask for the recipe, and give their thanks. All my thanks went to YOU! I gave them your blog address and sang your praise! Thanks for being so darn fantastic! See you tomorrow. Katie, Oh, no! I'm so sorry. I guess it's official now. They really can catch on fire. Now here's the burning (ha ha) question-did you have a cookie sheet underneath or the big sheet of foil that we talked about??? I would feel a lot more secure knowing that it was a butter drip that caused the problem-since that is easily resolved in the future. Let me know. Glad the two fireproof pies were sure fire successes! We were laughing our heads off! I had one on a cookie sheet and one on tin foil. The one on the cookie sheet was the pie that set the blaze. Fear not because I am pretty positive it was my fault. I think I scooted it too close to the edge of the stove. A tiny bit of the corner of the bag was touching the stove's edge inside. I guess I did not pay enough attention to that teeny-tiny detail! Who knew? Last year the marshmellows on my sweet potatoes caught on fire. This year it was my pie. Can't wait to see what happens next year! Either way...Those pies were the HOT commodity! Thanks Prudy. You helped out a ton. I now have beautiful pies to share. HAPPY THANKSGIVING! For this year, turkey is still the star of our table! Thanks for the recipes and knowledge you have shared to us! Enjoy! Well, I brined and gravyed and brown bagged my heart out today and boy, oh boy, did the compliments flow! Thanks for helping us make the most tasty Thanksgiving....EVER!